Did You Miss Me? I Missed You! Sorry I've been awol for so long — lots going on! I hope to resume regular posting tomorrow, but until then, please enjoy/recoil in shock and horror from this fantastic fabric sent to me by Julie. The more I look at this fabric, the more I want it. It says "Stunt Dress for the Cattlemen's Association Ball" to me (not that I've been invited). But, sadly, I don't know where to buy it online. Do you? Leave a comment! Oh, how I’d love to have a ballgown made of that stuff. I don’t know where to buy it, but I’d love some as well. My sister-in-law raises grass-fed beef and sells it. This would be PERFECT for her. Yes, needing some Dress a Day, t-bone textiles are a nice touch. It’d make a great dress for a barbecue. Ashley Wilkes likes to see a girl with a healthy appetite and a beef-based frock. It isn’t the US, but it has to be someplace that trades in dollars. I am going to a barn dance in Wyoming next month; this fabric would make an excellent skirt! The tags are written in French but the currency is $ – might that not make it a shop somewhere in French-speaking Canada? I’m sure you’ll make the perfect dress and story to go with it. I enjoyed your chat on PR last night. Thank you for that. And maybe with an over-dress with something like A-1 Steaksauce or some other such condiment! With father’s day coming soon, I think a BBQ apron for your “griller” husband/son/father would be cute. That graphic looks verrrry similar to a Threadless tshirt I bought for a good friend a few years ago…it was red and had a print of a t-bone on it…Google image search to the rescue! I’d be willing to bet that this was taken in Montreal. It matches with the other guesses of “French speaking place with North American money symbols”, but the clincher is the Canadiens Hockey logo fabric up in the right top corner. It’s totally Montreal. We have tons of fabric stores here, but I’d venture that this is from someplace in Plaza St Hubert. Well, I don’t know about the fabric, but I’ve got a daughter in Laramie who could probably get you an invite to the ball! I’m with Cookie, I was thinking kitchen too. Curtains, tablecloth, etc. I can’t exactly imagine a dress out of meat. I thought they were abstract tulips at first (just not expecting t-bones, I guess). I’m vegan and i love this fabric, it screams opportunity for contradiction and pranks…if only it was in Spotlight in sydney! So instead of skirt steak, you could have a steak skirt! I want to use it to decorate the storefront of the meat locker where we buy quarter cows. Their decor scheme is very functional. All that adorns their walls are award plaques from the state fair–best meat stick snack 2008, etc. To their credit, the walls damn near full; the awards go from the ceiling to my waist with barely 2 space between them. I’d also say that this comes from somewhere in Quebec, Canada, and is probably in Montreal. Most of the awesome, little shops there don’t have websites so someone would have to search for the fabric on foot. It would be better if the manufacturer could be found… but since the fabric is on sale (vente = sale), it might be discontinued, making that search harder, too. Oh Julie, next time you are by the shop could you check the name of the manufacturer for us? Pretty please? Maybe the producers of Americas Got Talent (and other such TV delights) should make little outfits out of this to present to their contestants? Meeooww!!! I will most certainly report back on the manufacturer! Im guessing Quebec because the signs are in French, but the prices are in dollars. Where else uses French and dollars (Canadian)? I need that fabric, I have a joke gift to make for someone. 🙂 Any idea where to find? I saw this today while shopping on St-Hubert. The store is Saratex-Sams Fabrics. Theres two signs on two storefronts but its all one store inside. It didnt have a pricetag on it but it was in the doorway of the clearance cubby, and theres three bolts of it ;-)514-278-9761, and they speak English. 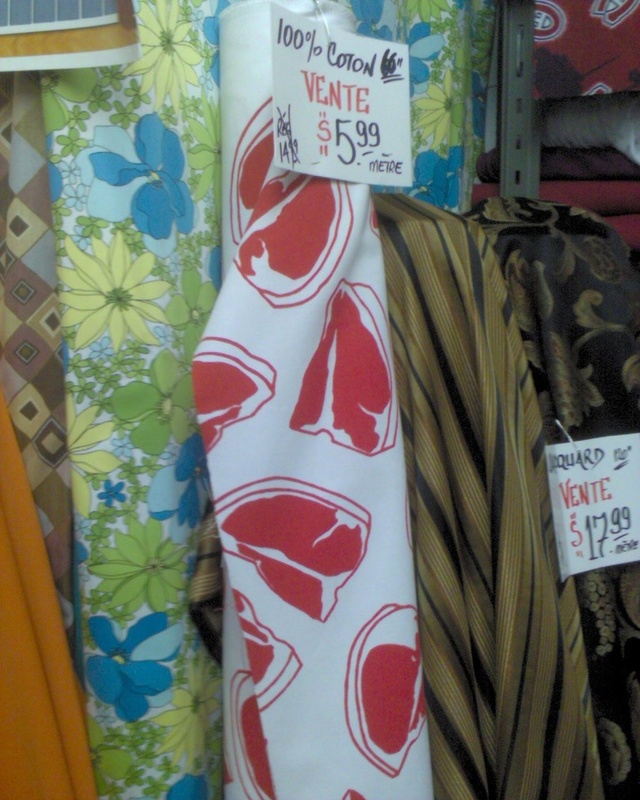 This is sold in the huge fabric store on the corner of Jean Talon and St. Hubert in Montreal. I saw this on your post and I knew exactly where to go! I bought over 4 yards, so I may have some leftovers when I finish my project. This is a really thick cotton. I just bought it at the textiles store on the corner of St Hubert and Jean Talon here in Montreal. I bought 2 meters to make a bbq dress and Ill probably have leftover fabric. Should I put it up on ebay? Does you have any of this left, Kerin? I need it! DO you have any left, Kerin?